Pop Culture Lunch Box: Yuck Rocks. Black Cat Sound Guys Don't Rock. Good friend Fran Chung wrote up the following review for the entertaining Yuck show the other night at the Black Cat in D.C. I'm just republishing his excellent take (which I completely agree with, and which appeared with this photo and others in DCist) rather than wallow through my own mixed emotions of seeing the show on the same night I got in my first car accident in decades (I'm fine, it wasn't my fault, and our Honda Fit didn't fare too badly). Despite that unfortunate distraction, I still give the show **** out of ***** stars. It was not as good as their recorded work, but I'm chalking that up mostly to the fact that the Black Cat sound engineers seem to be getting worse and worse every show I see there. The label "1990s revivalists" follows Yuck around inexorably, sometimes an epithet, often a term of endearment, always an apt descriptor for their retro-leaning indie-rock sound. 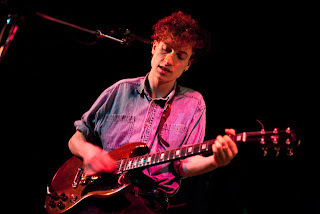 At the Black Cat on Wednesday night, the London-based four-piece wore it as a badge of honor, putting their own youthful spin on familiar tropes from the 20th-century's musically fecund final decade. On the set-opening "The Base of a Dream is Empty", the guitars of Daniel Blumberg and Max Bloom trailed feedback before the band built up a creamy wall of sound that instantly called My Bloody Valentine to mind. A few songs later, Blumberg affected a J Mascis-like drawl during "The Wall", while "Suicide Policeman" came off as a strummy, mid-tempo ballad reminiscent of early Belle & Sebastian, complete with tender boy-girl harmonies. Bassist Mariko Doi took a lead-vocal turn on the appropriately-titled "Georgia", which sounded like it could have been a lost outtake from one of Yo La Tengo's classic early-'90s albums. At the heart of the set came "Get Away", Yuck's finest song, and the one that best crystallizes their highly referential, yet distinctly appealing musical aesthetic. Bloom's bright lead guitar melodies sliced through the fuzzed-out mix on top of a throbbing, Pixies-esque bassline that propelled the song forward until Blumberg launched it into the stratosphere with his soaringly anthemic Sparklehorse-meets-Weezer hook. "Summer sun says get out more," Blumberg sang, "I need you, I want you, but I can't get this feeling off my mind." These were trite, jejune sentiments that have been expressed in a thousand tunes, but rarely with as much infectious verve. 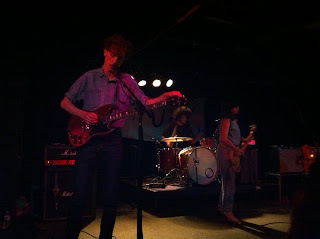 By the end of their brisk, hour-long performance, Yuck had run through much of their self-titled debut LP, adding the bonus cut "Soothe Me" and the B-side "Milkshake". As the band capped their set with another Kevin Shields homage, "Rubber", it seemed fair to wonder what the quartet could do for a second act. As fertile a trove of musical resources as the '90s are, surely they are not inexhaustible, and one hopes the band's next record will explore some different territories. For now, though, it's probably best to just go along and enjoy the nostalgic ride.